A few weeks ago our office and the Governor’s Council of Economic Advisors had our annual off-site meeting where we get out of Salem and into a regional economy to learn more about what’s going on. This year we were in Hood River where we had one panel discussion on housing and another on tech (the unmanned aerial systems cluster), in addition to two business tours. What follows is Part 2 of the discussions. All errors in terms of relaying information, or interpreting comments are mine. First, I wanted to give a massive thank you to Nate Stice of the Regional Solutions Team, and Carolyn Meece from Business Oregon for arranging the panels and business tours for our group. It was a great day due to the groundwork they did for us. Thank you! The second panel of the day focused on gorge technology, and consisted of Greg Davis of Overwatch, Ross Hoag of Power4Flight, Tammy Kaufmann of Insitu, and Kevin Below of Orbital UAV. As with many thriving clusters that began with a start-up company or two, part of the magic is a combination of happenstance and intentional efforts by the original founders to work on a product in a location they wanted to live in. The gorge unmanned aerial systems cluster is no different. Ross, who was either employee #3 or #4 at Insitsu back in the early- and mid-1990s, told the story of how they wanted to live in a beautiful area and work on these systems. They were fiddling with small aircraft out of an old school bus in the area. While such intriguing stories are part of the lore, the unique part is that this effort succeeded. Today, the panelists estimated, that the gorge is home to more than a dozen firms that employ around 1,500 workers in the region, which straddles the Columbia and state lines. The panelists discussed how they do have local supply chains. And being next door to the Portland region provided many resources as well, including the airport for both travel and shipping, professional/legal services, manufacturers, and so forth. However, this success was far from a foregone conclusion 25 years ago. First, the ideas and products had to be successful, of course. But a cluster of firms takes more than that. And, according to the discussion, there were noncompete clauses 10-20 years ago that prevented workers from spinning off their ideas into new companies, and also prevented suppliers from working with similar (i.e. competing) firms, and the like. As those noncompetes were eliminated, the broader cluster took off. For example, Kevin talked about how Orbital UAV, an Australian company, chose to locate in the gorge due to the existing companies and workforce. Success begets success. 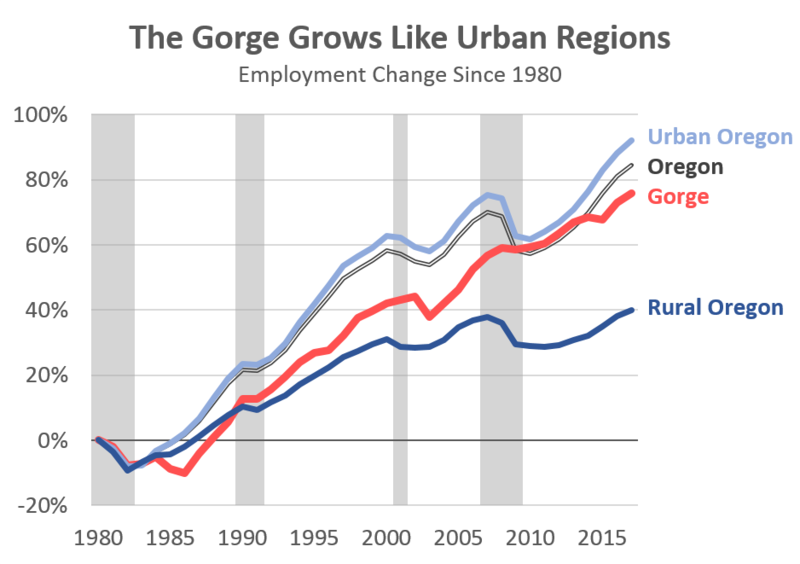 The gorge regional economy is certainly successful overall. In fact, the gorge is among the fastest growing rural economies in the nation in addition to being among the most highly-educated rural economies in the nation. And as discussed the other week, it is also among the least affordable areas too. After this overview of the UAS cluster and the region, the discussion turned toward two things: whether or not this successful is replicable in other areas, and also what issues or barriers to growth the region faces. We will start with the issues and barriers to growth. At the top of everybody’s list was housing; not just affordability, but also availability as inventory and vacancies are low. Housing is part of these businesses’ recruitment efforts. They have had employees accept jobs and then leave because they were unable to find suitable housing. Similarly, finding work for spouses and partners can be more challenging in a smaller region than in a large metro. Commuting into the gorge for work is somewhat common, as is remote work. Tammy discussed how Insitsu has an office in Vancouver, WA and runs a bus from Vancouver to Bingen, then across the river to Hood River and back every day (maybe multiple times a day? I cannot remember). Greg mentioned how his growing company is running into issues finding more office space. Also good internet access is at least an issue, if not a barrier. [These are part of the supply constraints our office has been highlighting, and included in our Rural Oregon report too.] None of the firms said they are actively looking to leave the region, but that growth is becoming more challenging and finding space or housing is a growing share of their daily activities, taking them away from their core products and services. Finally, another regional issue both panels mentioned was the need for the bridge across the Columbia to be replaced. That link is vital not just for the UAS cluster, but also for residents, and also as a transportation route, especially when parts of I-84 of SR14 are shut down due to weather, or wildfires as they were last year. In terms of the UAS success being replicable, the answer is likely no. The specifics of the individuals involved, the industry they were creating and the like are just that, they are very specific. However that does not mean all hope is lost. From our office’s vantage point, and most of advisors as well, it is less about the specific industry and more about the foundation upon which the success was built. Having a good workforce, infrastructure, planning, and taxing system in place, in addition to being able to provide information and contacts for firms looking for assistance is critical. These pieces of the foundation are the natural fit for the role of the public sector. It is really hard to pick winners and losers, but providing the platform from which any type of business can succeed is the goal. Finally, after lunch the Governor’s Council toured both Cardinal Glass’s plant just outside of town where they assemble windows for the Pacific Northwest, and also pFriem Family Brewers. It was a rough way to end the day, down there on the river at a brewery, but somebody had to do it. Not sure if I would hold my breath waiting for the bridge at Bingen to be replaced, given how well the effort to replace the I-5 bridge has gone. But it also seems like a properly-reinforced bridge at that location (or perhaps The Dalles) could play a key role in regional recovery from the aftermath of the coming Cascadia earthquake.